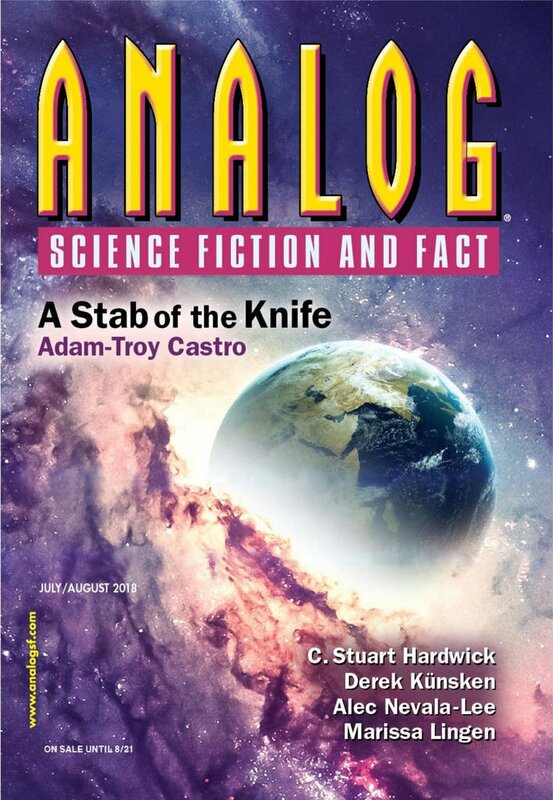 "Potosí," by Joe Pitkin [bio] (edited by Trevor Quachri), appeared in Analog Science Fiction and Fact issue 07-08|18, published on June 15, 2018 by Penny Publications. Pro: The plot is straightforward: secure the asteroid and return it to Earth, although this shifts to: repel the attackers and summon help. Solomon realizes he’s failed when he checks the news and learns that the secret it out, Magnus Corp won’t get anything, and military powers will fight over the thing. His decision to destroy the asteroid and sacrifice his life to avoid further bloodshed is at least plausible. Con: It’s hard to believe someone like Kalypso slipped past Magnus’s screening for such a key mission. I’d have expected Solomon to pick his own team. All the inter-personal problems therefore felt contrived to me. I found it hard to believe that Laxmi gave up on life so easily after Kalypso’s betrayal. I also found it hard to believe that Solomon couldn’t find a way to repair his ship and/or arrange for rescue. Also, I don’t think his strategy for destroying the rubble pile would work at all. The ship would kick a few rocks away from the pile and end up flying away with them, leaving the bulk of the pile untouched.